For years I’ve been watching the Chelsea Flower Show coverage on the TV thinking “is it really for me”? 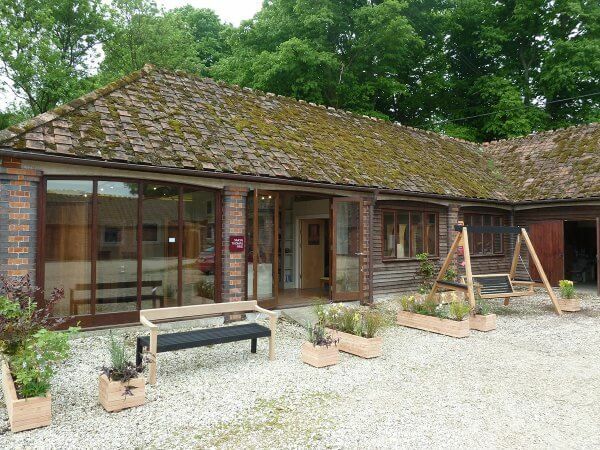 But recently I’ve been getting more and more drawn in; I have friends like Richard & Jane at Plankbridge Hut Makers and the Sculptor Simon Gudgeon who exhibit regularly and speak highly about the whole experience. 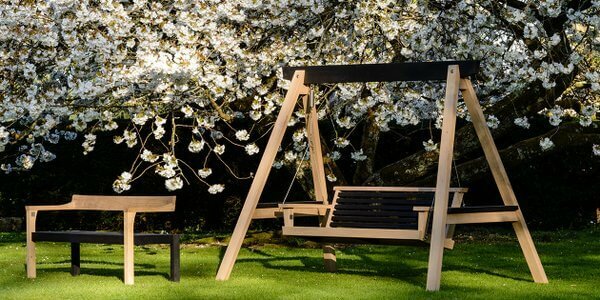 With so much of Sitting Spiritually’s focus being on RHS Chelsea every year it was inevitable that our world would have to align with theirs: The new Simon Thomas Pirie Contemporary Range which includes the Floating Bench and Yakisugi Swing Seat is now sold exclusively by Sitting Spiritually, it was our job to perfect the designs in the run-up to the show and make sure we had made enough stock to meet demand during and after. Of course it’s hard – almost impossible to work out how something is going to go down with the public and as a result how much stock to make beforehand, but Martin and the team have years of ‘Chelsea’ experience to fall back upon and understand the rhythm of the show and its visitors well. The same couldn’t be said for us, so John and I, accompanied with wives, thought we’d better go and ‘do’ the whole Chelsea Flower Show thing. Turns out it’s impossible not to get swept up in the atmosphere; the celebs, the TV crews, the show gardens, the awards, the incredible flower displays in the pavillions and just the general sociable hubbub. We arranged to meet clients and friends there and ran into many more entirely unexpectedly. It’s lovely, and is a total antidote to the ‘design show cool stand-offishness’ we are used to. For all of that though, it is for a large part a high-brow trade show right in the centre of London’s most expensive district and there is serious money being spent on and off the stands. It’s the right place to bring the new Simon Thomas Pirie Contemporary Range and we were all pleased with the reception it received. In the end Sitting Spiritually had their best year ever at Chelsea Flower Show, with the new products representing about a third of the items sold. What was even more encouraging was that the kind of clientele that came onto the stand we were different to those who tended to come and buy the more traditional swing seats from the other ranges. This was exactly the more design conscious audience we were hoping to woo. 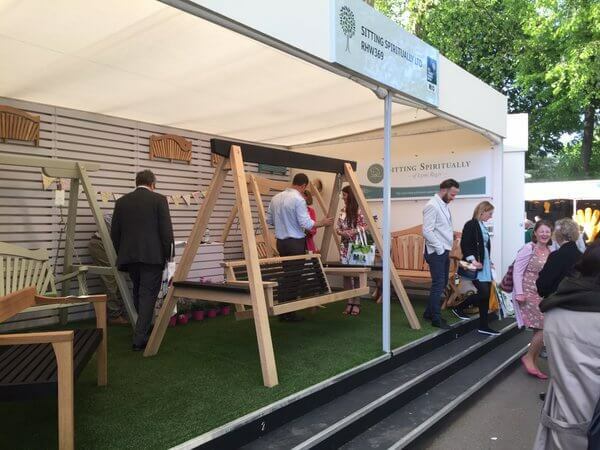 Floating Bench was shortlisted as one of the ‘RHS Chelsea Garden Products of the Year’ which meant there was also a two-seater version on the Finalists Stand. That nomination in turn meant we got even more great press then anticipated, appearing in The Sunday Times, The Observer, the Mail on Sunday and The Sun the weekend before, as well as lots of the glossy mags in the preceding month. You can just tell when a product is going to hit the ground running, Floating Bench really did have everything going for it and it felt like it was everywhere for those few weeks. The Yakisugi Swing Seat also had its moment in the limelight though, getting it’s fair share of press attention. The high point for Yakisugi was when Sitting Spiritually were asked if they could provide one for ‘Jardin Blanc’, Raymond Blanc’s very exclusive RHS hospitality area. We dropped everything and finished one in double quick time! As it turned out a rather lovely hosepipe won RHS Chelsea Garden Product of the Year! To be fair it was rather a sophisticated garden watering system called the Hozelock Cloud Controller, more to do with a modern phone app control system than the hose itself, but saying I got beaten by a hose made me feel better! Still, just getting shortlisted was a big coup in terms of raising the Floating Benches profile. By the time we said goodbye to Martin, Celia and David on the stand it was near closing time anyway and our feet, eyes, nostrils and wallets could take no more, but we all agreed we’d be back next year; that we’d spend an extra day and be working hard on new products. Turns out Elvis Costello was wrong, “I do want to go to Chelsea”. 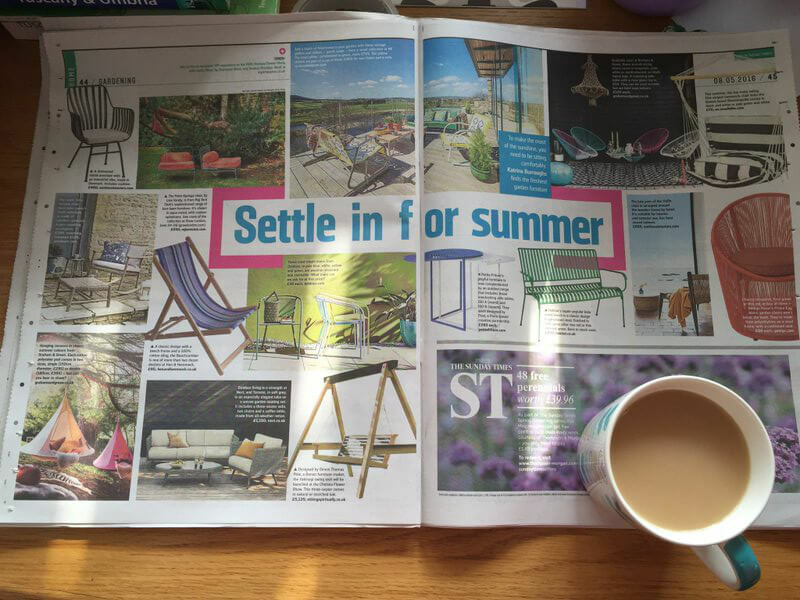 Although Chelsea Flower Show is now over you can catch both the Yakisugi Swing Seat and Floating Bench at our studios as part of Dorset Art Weeks Open Studio’s which is on until Sunday 12th June. For further details click here. The story of how the Simon Thomas Pirie / Sitting Spiritually collaboration came about is featured in a previous feature on this blog. Click to read more.